Blatter’s ignorance to a plea of help. The referee’s paradox. | @_The12thMan. The voice of a fan, from the voice of fans. Blatter’s ignorance to a plea of help. The referee’s paradox. So, we have a week off from the ups and downs of the Premier League, but the joys of being a football fan does not stop there, oh no. It’s the turn of the Welsh and the Scots this week to bemoan the poor officiating which has cost their side dearly in the international break; Wales, playing at Wembley, trailing 1-0, see Aaron Ramsey play a pass his old captain would have been proud of, to the sprinting Gareth Bale, the Tottenham winger controls the ball and is ‘1 on 1’, only to be flagged offside, wrongly. What could have been. Mind, Rob Earnshaw had a chance to make amends had he not blazed a complete sitter. 3 days previous, at Hampden Park, Scotland suffer in the ‘tale of two penalties’. At 2-1 to the hosts, Czech striker Jezek dives under the presence of Wilson and is awarded a penalty, converted by Kadlec. 2-2. Then 50 seconds later, Christophe Berra has his ankles taken and nothing is given. A very costly draw for the Tartan Army’s chances of Euro2012 qualification. So the argument was re-ignited; do referee’s need help? I think the world of football is crying out for it. 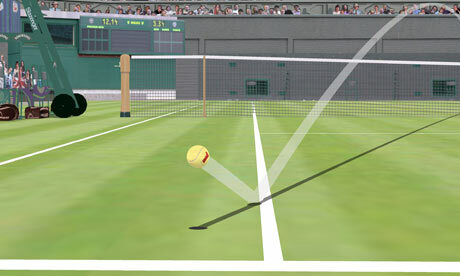 Hawk-Eye, used in Tennis to determine boundary decisions. Sport as a whole has always been surrounded by an aura of controversy, but with the development of technologies in the social and media universe, other sports have developed with the advancements; ensuring whilst the referee has final say, he is in a position to use the media to review the incident. Rugby uses the video-ref, tennis has hawk-eye, in American Football you “go upstairs”, and any race, be it horses/cars/humans there is photo-finish and in-race conduct being monitored. Football is being left in the dark ages, held by the stubborn-ness of a Swiss dictator refusing to budge over the pressing issues. These decisions are literally re-writing history; Spain, won their first World Cup in 2010, however, in the Semi-Final vs Germany, Germany should have been awarded one penalty, and could easily have had a second. Costly in a game finishing 1-0. Furthermore, in the final, Dutch winger Robben had broken free of the Spanish defence only to be pulled back by Puyol as he attempted to shoot, could have been a game-changing red card in extra time. The cynics will argue that it takes power away from the referees; but I feel it empowers them to officiate in a fair and proper manner. Referee’s will still be able to put their personalities onto a match; the leniency of Webb, the pro-penalty-giving nature of Dean. But the integrity of the sport will remain, and the ‘buck’ will ultimately stop with the referee. Under current rules, referee’s are being blamed for incidents in which they really cannot be expected to know for sure. Frank Lampard’s shot clearly crosses the line, but officials didn’t spot it. Take Germany vs England, for example. Whilst the Lampard phantom goal was blatantly obvious for us to see at home, one must consider; we had an elevated angle, we also had the benefit of a replay for clarification; it would take the 4th official a matter of seconds to confirm the correction to the ‘1st official’ and the goal would have stood. As it stands now the referee’s are so bound by dated rules that they can’t even use the replays on the stadium monitors to be sure, regardless if the fans can see an injustice: (Argentina v Mexico, WC2010, Arsenal v Everton BPL 2011). 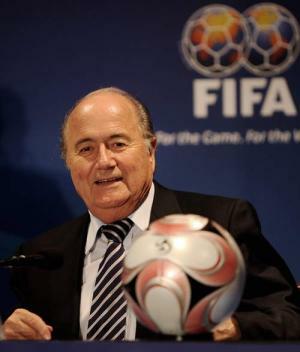 Sepp Blatter: “The International Football Association Board is of the opinion that football will remain, for the time being, a game for human beings with errors on the field of play. We will try to improve referees but you will never erase errors completely.” – A categorical ‘no’ to the thought of video replays. Mr Blatter argues that video replays would make the game inconsistent, and the stop-start nature of the game would deter fans. My first argument is; football is already more stop start than everyone realises, with every corner/throw/goal kick etc taking an extra 15/20 seconds. Last season, the average ‘game-time’ of teams, i.e., the time that the ball was actually on the field and in motion, was around 75mins. With the lowest team being Stoke City FC. Averaging around 68mins per match. I think Rory Delap can have 5/6 of those minutes himself. My 2nd argument, and my solution, is; 3 unsuccessful challenges per side. The same as used in tennis. Assuming all challenges are used, at an average of 30 seconds for the 4th official to confirm/deny, that would only add 3 minutes to a game. Which is hardly an inconvenience for the sake of a fair result. Sepp Blatter, President of FIFA. Next, Mr Blatter wants to avoid scenes of players crowding the referees for every tedious decision. My solution to that would be taking a spin on the Rugby system of communication with officials; Only the captain/manager can request use of a challenge. Additionally, the sinned/sinned against player can too, in events of penalties/red cards etc, but captain must be present on field. ….But…..with a few tweaks; whilst rating referee’s will be averaged I think it needs to be weighted; i.e. 25%, home manager, 25% away manager. 50% by the match assessor. That would counter the ever-moaning managers; Wenger, Ferguson, Pardew. And also protect the opinions of certain managers who never seem to complain too much; O’Neill, Bruce, Martinez. Additionally, I completely disagree with the small pool of referees in the Barclays Premier League. In my opinion, this causes familiarity; which is detrimental to the chances of a fair referee. For example, how many times have you heard the phrase “he’s not that type of player”? My point being, if Joey Barton makes a late tackle, all of a sudden all his previous misdemeanours are poured onto him and a collaborated decision is given. On the other hand, Theo Walcott, a player with only 2 yellow cards to his name in his Arsenal career, if he makes the same tackle… Are you trying to tell me that you’d give the same decision? I doubt it. Notice how Clattenburg takes a yellow card out of his pocket, then following an exchange of words with the Liverpool skipper, he changes Hibbert’s punishment to a red card. Worrying. There are 18 referees with Premier League status, or to give it the proper name, 18 are full-time members of the ‘select group’, appointed by Professional Game Match Officials Limited (PGMOL). With Jon Moss and Neil Swarbrick sharing a part-time status after both officiating 2 PL games each last term. This means, that there is on average less than 1 full time referee per team, from that, in 2010/2011 it varied from Phil Dowd refereeing 30 games, and Anthony Taylor officiating 13. Moreover, and I hope you’re keeping up!, ‘high profile games’, between top 6 sides, bottom 3 sides, or derby games, go to the referee’s said to be the best; Dean, Webb, Dowd, Atkinson, Foy, Walton. Which can only mean familiarity for the top sides. Which is leading to fans accusations/predictions, and pre-emptive conclusions of ‘the unfairness to come’, all before some games have even started; I.e. Mike Riley had given Man Utd 8 penalties in 8 games at Old Trafford, Webb has given Man Utd 3 penalties in 6 games vs Arsenal, Atkinson is said to bias toward Chelsea, 13 games unbeaten under him. And Webb is said to always lean toward the home side. Meanwhile Dowd has a habit of placing himself at the centre of controversial results, comebacks, game-changing moments, etc. 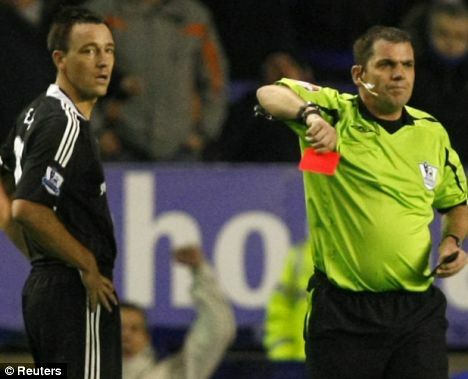 Phil Dowd dismisses Chelsea skipper John Terry. The thing is, the more help referees can get, to enforce the laws of the game, the easier the whole process becomes. A referral system gives the referees a chance to make a confident decision, and it takes away the curtain if the decision is wrong. Therefore it makes the individual accountable, which will lead to punishment, which will mean the referees that are the best, are officiating at the highest level. It’s a conclusion that everyone wants. I am 100% Blatter and Platini; Out. They are corrupt, elitist and racist (in their constant ignoring of the monkey chants at Camp Nou, yet chasing trivial issues). Whatever happens in the future – and, who knows, football might end up embracing technology as other sports have done – criticism of referees is unlikely to subside completely, but at least football will be rid of the blatant injustice which is currently crippling the sport. This entry was posted on Wednesday, September 7th, 2011 at 21:41	and posted in Corruption, Football, just a thought., Random, Uncategorized. You can follow any responses to this entry through the RSS 2.0 feed. « “How important we are to England” – Manchester United. I have some sympathy for the argument that references to videos during games could undermine the drama that we fans experience at games. The telly pundits may have a different view. Part of the culture of the supporters’ coach ride home after away games is pulling apart the performance of referees. However, the case for goal-line technology is overwhelming. More important than this, is the potential of video evidence for diving, a playacting to obtain red cards for opponents. There should be severe sanctions for this sort of cheating. I am pessimistic about a serious move in my direction. The culture of skullduggery in Blatter’s FIFA is so deeply ingrained. Totally agree with most of this, especially goal-line technology which is definatley needed. Also I’ve never thought about the familiarity of referee’s becoming a problem, but after reading this, especially with the Joey Barton and Theo Walcott examples i think your right; but then you would possibly risk worse referee’s taking charge of important games, which could also result in poor decisions. One thing though if the tennis system of 3 challenges was used, i think teams could opt to use ‘a challenge’ when under substantial periods of pressure, which would slow down the game. this is one of best articles i have read about the whole video technology/ blatter-platini fiasco! the sooner those two are out the better, i agree. the 3 challanges system is a great idea. I thought of it myself last season! give both teams 2 “time outs” a half. for any televised or game with more than 3 camers, where the captain or manager can call the referee to review the video “evidence”. will take less than 30 seconds. i watched a masters game a couple of seasons ago where there was a table on the half way line with two monitors on it and it took less than 30 seconds to review a decision and change the game fairly. Great system. Unless you’re a Championship club, of course. Good point that! – To be fair, I didn’t even think of it. Championship shouldn’t suffer! But I guess it would allow for all referee’s to feel good performances will bring promotions, therefore strive to be the best they can? I totally agree with your assertion. To continue to ignore technology in this day and age is inexplicable. Blatter/Platini arguments just don’t hold any weight. They just seem to be old fuddy duddies that are resisting change. Change for the better. Change that will ultimately benefit the game. Technology is important for goal line clarification. However constant referral to other issues would undermine the excitement. Controversy is part of the fan’s experience. I don’t agree with the argument that video referals would waste time – if a “goal” is scored and the player is offside then the 4th official can view the replays as the players are returning to their positions for the restart kickoff. If he sees it was not a legitimate goal he tells the referee who then changes his decision and awards the free kick. If it was a legal goal the game continues without any wasted time. 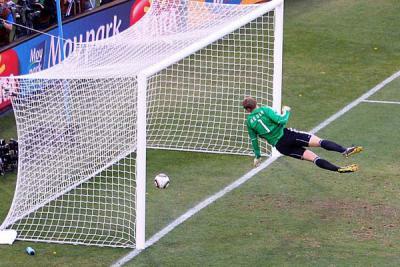 Goal line technology – no brainer (except for the muppet Blatter). Now for my pet hate : players cheating the referees by diving and faking injury to have other players sent off (you know – those headbutts that wouldn’t even put an eyelash out of place). Sure, people shouldn’t be be putting themselves in a possition by lowering their heads when in confrontational situations. My solution: At the start of next season ALL football managers AND captains are gathered together and told there will be video reviews of all unsavoury incidents in all games and any cheating will be punished severely – six matches for example. A dive in the penalty area that gets a penalty – ten matches, and if that penalty causes the team to win or draw it becomes 15 matches. If a players is charged he and his manager will attend the hearing with A lawyer – the hearing will comprise of previous players of good reputation (if there are any! ), human motion specialists and referee representatives. It’d be thorough and open – if it is indecisive then no penalty is given, But if it is clear cut then they get the clearly severe punishment. A manager without a key player and a club owner paying someone 100,000 plus for 10 weeks or more would change the metality toward cheating greatly. The reason i think this would be succesful is a similar “trial by video” system has been used by the AFL in Australian Rules for over twenty years – at first mainly to cut out off the ball and behind the play violence but is now reviewing dangerous tackles that don’t get noticed by umpires at the time and other unsavoury incidents. There are various refereeing scandals in progress around the world – it’s most likely endemic, despite FIFA claiming each new one is just an isolated incident. How many times have you watched a game and put an appalling refereeing decision down to bad luck? Nobody questioned Hoyzer’s integrity at the time – just consider how much easier it is to manipulate results when two teams are more closely matched, or you’re helping the big team everyone would expect to win. FIFA and the people who run it have a vested interest in maintaining the referee as ‘god’ who cannot be challenged, because reducing the power of the referee to guide games to the desired result weakens the commercial power of FIFA. Sponsors want the hosts to progress, and they want the big popular teams like Brazil through to the end, even if they’re not playing well. What you have at present is a regime where a referee can arbitrarily determine the result of a match. This is a proven fact. That’s exactly the way FIFA wants it to stay. Why can’t a TV official review from the stand. With Jack Rodwell’s example he is sent off and leaves the pitch and the game continues. The TV official reviews it sees its wrong and informs the ref who waves him back on like he will do with injured players. The game is not held up but more importantly the game is not destroyed by a shocking decision after only 22mins. Technology has the solution and being used in every other sport. Football is the only sport where cheating and tricking the ref is prime but is the biggest sport in the world with the most money? I agree about the challenge rule, I’ve been saying to anyone who will listen for ages, although I would give only two challenges per coach per game. Football should look to other sports for a number of ideas. What about the rugby league on report system and the disciplinary committee, you want to remove diving or simulating, review the game with hindsight, and slo mo and dish out bans. Good article with well argued points but you have failed to address the huge issue of the game becoming two (or more) tiered as a result of introducing video replays and ‘upsatirs’ decisions. It is doubtful that any other league but the Prem (and possibly Championship) will be able to implement this technology, and before we know it the game will move inexorably towards a situation where the top leagues are reliant on this technology, and the way that football is played will change forever. At the other end of the spectrum, we will have the old game with old rules and ‘antiquated’ human decisions from refs. It may work like this in other sports, but (thank god) football is not other sports.